The Demilitarized Zone between North and South Korea which hugs the 38th parallel is a place which former President Bill Clinton called the “most dangerous place on Earth.” Created as a part of armistice negotiations in 1953, the two-kilometer wide DMZ is a stern reminder that North and South Korea are still technically at war and that the United States paid a heavy price to protect South Korea during the “Forgotten War” from 1950 until 1953. In spite of all of this, there is one place where tourists can visit the DMZ and enter North Korea by crossing the Military Demarcation Line between North and South Korea: the UN-controlled Panmunjom complex, set up inside of the Joint Security Area. Straddling the 38th Parallel, this is the only chance most people will ever get to see North Korea from the free world. I joined a USO-sponsored tour to the JSA five days after North Korea conducted their most recent missile launch (February, 2016) and present you this photo essay about the experience. USO runs the best tours and I highly recommend booking with them several weeks in advance if you are looking for a day trip during your next stay in Seoul. You can click here for more information. After meeting our tour group a few minutes before 7:00AM at USO HQ, Camp Kim, in downtown Seoul, we hopped on a bus began the 90 minute bus ride to Camp Bonifas, located just inside the South Korean side of the DMZ. We were quickly asked to sign some paperwork that said we were entering an active war zone and were putting our lives at risk by continuing on the tour. After handing in those papers, our tour continued on a long stretch of highway towards the DMZ. As we approached the checkpoint to enter the United Nations-controlled segment of the border, or bus swerved back and forth to avoid several barricades as raindrops slid down the bus windows. Once the bus came to a stop at a border checkpoint, an American soldier, Private Kennedy, boarded the bus and checked all of our passports before we could proceed to Camp Bonifas and UN Central Command inside of the DMZ. He would be our tour guide for the rest of the trip. After we arrived at Camp Bonifas inside of the DMZ, Private Kennedy ushered the tour group into an auditorium to deliver a briefing about what we were going to see on today’s tour. Aside from simple instructions about what to do and what not to do on the border (pointing, gesturing, taunting, and yelling were strictly prohibited), we were informed that because of escalated tensions on the border we would be unable to visit Dorason Observatory, a location which provides one of the best views of North Korea from South Korea. We boarded our bus and began one of the most interesting rides of my life, down a narrow road towards our next location: Panmunjom, the famous blue buildings which straddle the 38th parallel and are in both North and South Korea. We were prohibited from taking photos on this stretch of the tour, but the wildlife and scenery inside the DMZ were out of this world. White cranes, massive buzzards, and other rare birds were numerous in the rice paddies and barren hills and parched landscape which set between North and South Korea. The restricted nature of the DMZ has, ironically, turned it into one of the most ecologically diverse places on earth. Along with the wildlife, barbed wire fences, mine fields, and military outposts sat on top of various hills as clouds and mist obscured the distant landscape. Rice paddies and rusting vehicles were also visible off in the distance. After a short briefing, Private Kennedy informed us that the Korean soldiers were real and we were not to touch them or get within six inches of them. He then let us know that anyone who stood to the soldier’s right was in South Korea and anyone who stood to the soldier’s left was in North Korea, just past the 38th parallel. The picture that follows was taken from the North Korean side and shows the 38th parallel in the middle. The sand is North Korea and the gravel is South Korea. Inside of the conference room, a soldier stands at the ready with his back to North Korea, preventing any tourists from either being abducted or choosing to defect to the Communist North. Outside, things were just as tense but in a more visible way. A North Korean soldier appeared several moments after our group re-emerged from the conference rooms. As we positioned our cameras, he played a game with us, ducking in front of and behind the pillars on the North Korean border facility. He kept a vigilant watch during this act. His appearance stood in stark contrast to the South Korean guards on our side of the border. The imposing concrete facade of the North Korean side provided a backdrop which perfectly illustrates the differences which keep Korea divided to this day. Our tour then continued to some other spots inside of the JSA. We stopped by JSA tower to take in another stunning view of North Korea from a military observation point very near the location of the famous axe murders and the Bridge of No Return. As the weather began to clear, more of North Korea’s bare hills were visible, but we could not see the famous flagpole bearing a 600 pound North Korean flag. Because the North cleared out all trees to prevent defections several years ago, it is very easy to see where the border lies in the distance. The clouds were eerily representative of the mysterious nature of North Korea to the outside world. The Bridge of No Return was a location where POWs chose between the North and South following the armistice and where several prisoner exchanges have taken place since 1953. President Clinton visited the bridge and attempted to walk on it, resulting in its subsequent closure to tourist groups. North Korea beckons across the Bridge of No Return. The Bridge of no return is seen in the last part of the photo, with North Korea in the background. The foreground is part of a footpath to our outlook point. After a few more minutes on the bus and a stop at the JSA gift shop, our tour with Pvt. Kennedy was over and we were on our way out of the DMZ to stop at one of the famed infiltration tunnels leading from North to South Korea. I could not take any photos there because of the nature of that tour, but some Korean soldiers left their helmets on a table during our lunch break to close out the tour. As an American with an interest in the Korean War and military history, the DMZ was always one of my top travel goals when I moved to Japan several years ago. I am very happy I got to visit during a time with such high tension and recommend everyone visit before the DMZ is either closed to tourists or ceases to exist. This is truly the last vestige of the Cold War left on earth. All of us have favorite places on the planet. My hometown is a nostalgic place. Philadelphia and Tokyo always hold a special place in my heart because I studied in both of those cities. With travel and historical knowledge, I have come to love places like Macau, Rangoon, and Hong Kong. One place I had visited and liked, but not loved, was Seoul, South Korea. I had been there several times but never had the one experience for which everyone lusts when they go to a new place while traveling. Whether it is meeting new friends, having an amazing meal, or just having a great night out on the town, we need an experience to solidify our love for a city when we travel. During my most recent trip to Seoul, I had that experience. 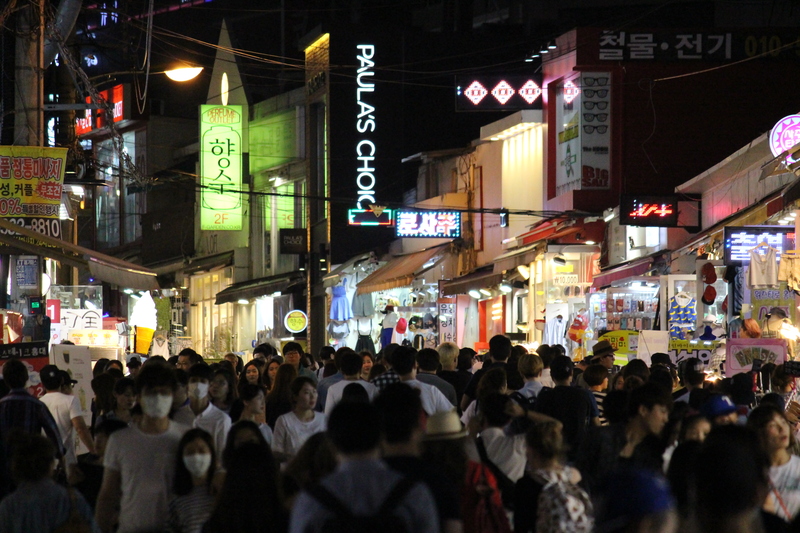 During our second night out in the city, my friend and I decided that we would head out in the early darkness to take some photography of the masses in famous spots like Hongdae and Myongdong. Our accommodation was located right in the heart of Hongdae, so we headed out to do some people watching as the sun began to set on this balmy June evening. 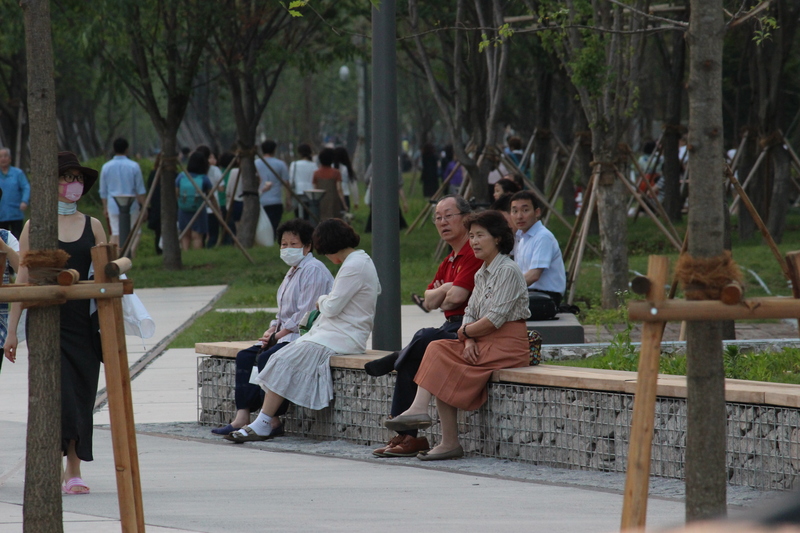 People of all ages were out and about chatting, playing, and enjoying the evening. From there, were off into the Hongdae night, not knowing what to expect nor what waited for us. For those of you who have never been to the Hongdae area, it is quite a happening place at night. Situated next to Hongik University, lots of young Seoulites, Westerners, and tourists pack the area for some of the best nightlife in all of Asia. Nightclubs, bars, restaurants, and a lively street music scene make this quite the happening place. Further down the main street, shops are filled with patrons as the streets teem with people heading to their destination for the evening. The glistening lights, talking masses, and smell of grilling food make for a unique atmosphere. As we approached the famous jaywalking intersection– where Koreans and visitors alike disregard crosswalks and cross at will– an interesting tune came to our ears. A younger man was singing in English and in Korean so we approached the growing crowd to have a listen. Sure enough, he knew how to handle a crowd. His band filled the evening with some great scores and kept the Korean crowd engaged and excited in between each one of his songs. Then, suddenly, he stopped singing and called my friend and I into the middle of the circle. He wanted to talk to us and translate for the Korean onlookers. After a while he asked us about from where we had come. When I responded that I was from Pennsylvania, things got very interesting. As it turns out, he went to high school at a place called Lower Dauphin, about 40 minutes north of my hometown. They were in the same athletic conference as my hometown high school so we had an instant connection. As he explained to the Korean crowd how close our hometowns were, he decided to sing us a tribute song, wishing us well on our journey and travel in Korea. These types of moments when you travel are what make you never forget a place. Please watch some of the video as he took my phone and sang for us and then got the Korean crowd involved, chanting the chorus and wishing us well for the remainder of our stay in Seoul. As soon as he struck his first chord, the crowd came alive and sang along with him, much to my delight. He sang and they chanted with him in a booming voice. The energy continued to build as they sang for three minutes to wish us well on our journey. Certain nights or events in our life create opinions and strong feelings for people, places, or things. This song and the openness of the Korean people certainly changed my opinions surrounding Seoul. This was the night I fell in love with Seoul. I need to come back again to truly develop an appreciation and understanding of the city and its complexities. I have only ever felt this way about one other city in Asia, Tokyo, and I have been living in Japan and making frequent trips to Tokyo for the last two years.